In episode 308, Douglas Brown interviews Carl “Lord” Webster, Solutions Architect for Choice Solutions, LLC. 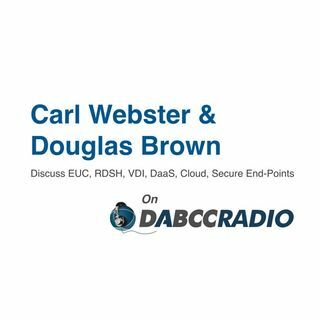 Webster and Douglas discuss Carl’s career in EU, his views on today’s EUC world including RDSH, VDI, DaaS, Cloud, secure end-points (thin clients), being a CTP and much more. Mr. Webster is a great guy and always so much fun to chat with. This is an entertaining and exciting podcast! I hope you will enjoy it as much as we did recording it! Webster is a Sr. ... See More Solutions Architect for Choice Solutions, LLC and specializes in Citrix, Active Directory and Technical Documentation. Webster has been working with Citrix products for many years starting with Multi-User OS/2 in 1990. Webster is a highly skilled senior technology manager with a more than 20 years experience leading the design, development and implementation of enterprise projects for high profile global customers. His strong technology skills are balanced by the proven ability to recruit and develop highly talented teams of technology professionals and guide their performance on short and long range projects. Webster has led complex projects for key customers in multiple industries, including medical suppliers, direct mail providers, sports marketing, a major grocery chain, and large regional medical facilities. Webster’s background also includes success as an entrepreneur. As the founder and director of a technology consulting company he established the standards, practices, and policies that built a fast growing company supporting the technology needs of 600+ customers across a three state region. With a strongly analytical approach to every new problem, Webster has been highly valued by his clients and his colleagues for the ability to understand the complexities of unique business problems and design solutions and process improvements that have a substantial impact on the bottom line. He has mastered the method of managing the information technology function as a partner in business success. Webster’s career preparation included a series of trainings and certifications in key technologies, but his accomplishments over time have been largely driven by strengths in relationship management, strategic planning, and operational expertise across the full scope of business and client management.